It’s their ‘biggest change’ in 26 years. Pizza chain, Eagle Boys, has undergone rebranding, sporting a fresh new look for the brand. According to the brand, the new logo represents the brand’s core values of delivering excellent customer service and great quality food, as part of the local community. “From the Eagle Boys Support Office to the franchisees and store staff, we’re all very excited about this rebrand. It’s been a long time in planning and this week we are seeing the passion, hard work and happiness behind the brand come to fruition. “Over the years, Eagle Boys’ focus was to provide great quality, great value meals to our local communities and through our brand’s refreshed mantra, we want to ensure we are doing everything we can to make our customers and local communities happy,” said Bruce Scott, Eagle Boys Pizza CEO. Aside from the logo, the brand revealed several other innovations that will be introduced. New pizza boxes and uniforms for the Eagle Boys staff will match the revamped look of the stores, plus, a new menu and website will also be launched. The new menu will feature three new ranges of pizza—EB’s Favourites, EB’s Classics, and EB’s Finest, which boasts new pizzas such as The Texan, The Cappriocciosa, and The Italian. Moreover two new salads—the Mediterranean Salad and Garden Salad, will also be added on the menu. 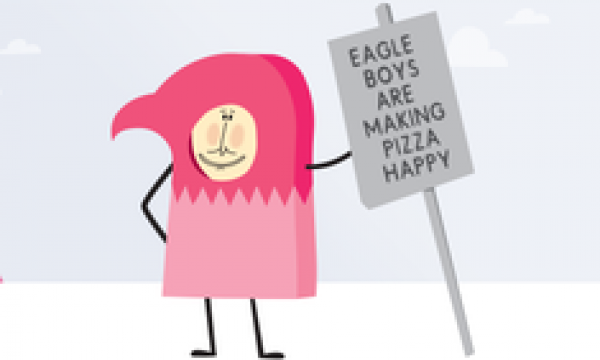 In line with the brand’s new business campaign, “making pizza happy,” a community assistance program called the Eagle Boys Happiness Fund will also be introduced. “The fund’s purpose is to give a helping hand to our local community and support those who support us. “This is part of our DNA of ‘making pizza happy’. We want to spread happiness throughout Australia and believe we can really make a difference for people who need a boost. “Whether our stores can donate pizzas to local hospitals for pizza parties or raise funds from pizza donations, we’re looking forward to helping as much as we can,” added Kate Pettiford, Eagle Boys Head of Marketing.